Well its been a long process, but I can see so much better now. I never realized how bad my eye was until I got my new glasses and can see the world clearly now. The colors are so much brighter and can see how dusty my home really was. I've been busy cleaning and getting the home ready for the winter. They forcast our first snow tonight so I guess I'm ahead of the game. I have been asked to sell my glass at a local craft show in late Nov. I have been busy making some small items I hope sell well. I've made some beveled snowflakes,hearts and bell ornaments. My only problem now is trying to figure out how to display them as I only get a 6-8' table and no electricity near me. Wish me luck. Tomorrow is my eye surgury. I sure hope when all is done I will see clearly again. It's no fun trying to do things with a blurry eye. 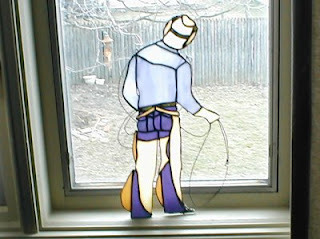 I will have to take its easy for a little bit, but cant wait to get back to cutting glass without the aide of magnifiers. I just found out that my Santa panel posted below got a 3rd place ribbon at the fair. Not bad. Last year my lighthouse came in 2nd and went on to get honorable mention and the state. Guess I have to keep trying for the blue. This is my newest project. All the pieces cut and ready for foiling. Hopefully be done before the weekend, because having catarac surgery Tuesday. 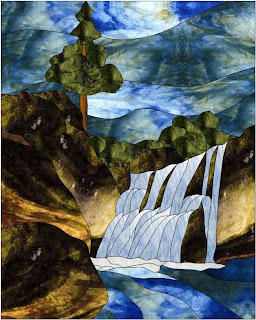 This pael is called Tranquility Falls and was designed by Kev of Focal Point Glassworks. I plan to hang it in a light box. Its 30 x 24. 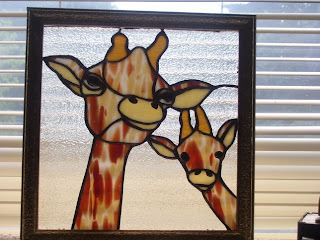 My name is Diane and I'm from Derby,NY, and addicted to stain glass. As growing up I would see many of the beautiful windows in churches and dreamed of making them. But something always got in the way. So in 2001 along with 3 of my coworkers we took a class, that was it I was hooked. Until now I have made many things for myself and friends and family, like the surfboard panel above that I made for my grandson and the giraffe made for a a dear friends son's first child. From this I have recieved a few commisions which hopefully will open a new venture.